Welcome to the bonspeed Wheels Gallery. Our gallery is a constantly evovling showcase of the hottest muscle cars, street rods, customs, trucks, low riders, donks, street and exotics riding on the industries finest “High Intensity Forged Alloys” - bonspeed Wheels! Of course you will probably recognize quite a few of the award winning rides featured in our galleries from various magazine spreads, online features or national car shows. But you dont have to be a show winner to have your ride featured in our gallery. We encourage all of our customers to send us images of their vehicle riding on bonspeed Wheels! Want to have your ride featured in our hall of fame gallery? Well, here’s a few tips to getting the best pics of your ride and the best results for showing it off here. #1 - Bigger is Better! I know, I know, they always say good things come in small packages. Well blah, blah, blah, not here brother! We want to show off your car, so make sure to send us the largest resolution possible of your photos. #2 - Keep off the lawn! We can’t tell you how many pictures we have gotten of the sweetest ride sitting in a field of knee high weeds or grass?! Now we are not asking you to turn into a location scout and to only send us pics that are elaborately staged. Just take it out in your driveway, a parking lot or even the street in front of your house would work fine with us. #3 - Keep it simple! We know it seems basic, but please keep your shots simple. No girlfriends laying across the hood. No little kid dolls leaning against the grill of your hot rod. No shots of your car from the local Good Guys show with the hood up and all of your buddies sitting in lawn chairs with a cooler full of Pabst near by. These shots are cool for your personal photo album, but we are trying to show off your ride and those things will just be a distraction. #4 - Where’s the beef?! Last, but not least - dont forget the wheels! We know you have spent a lot of money on your car and your proud of the ground shaking sound system, the supercharged motor and the custom interior. But don't forget to send us a nice shot of your ride with our wheels being featured also! 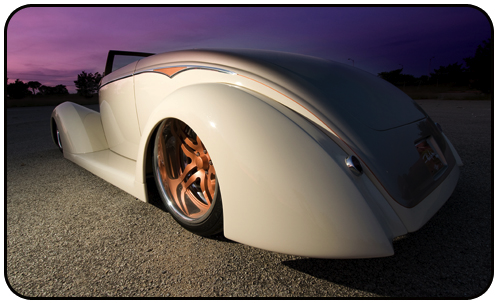 We look forward to seeing all of your shots and featuring them here in the bonspeed Wheels gallery! Have your pictures all ready to go? Then send them directly to our graphics department at: bonnwatch@aol.com and we will get them posted! The Gallery Ride of the Month is our new feature to start giving you, our loyal customers some recognition. Of course you will probably recognize some of the rides featured from various magazine spreads, online features or national car shows. But you dont have to be a show winner to have your ride featured in our Gallery Ride of the Month. Just send us pics of your ride running bonspeed's and we will work on featuring your car in our gallery or maybe even a whole feature on it!